As Interflora’s headline says sometimes ‘…words are not enough’. Email marketing is a powerful and cost-effective way of reaching customers and prospects with targeted messages. Typically, Interflora and similar providers send emails with a large range of products. By offering a range, they hope to extend the appeal of the email offer to more people. However, for a given sized email, the downside is that if you feature lots of products than the image size and copy space for each product is smaller. For products like flowers, the smaller images may have less impact. 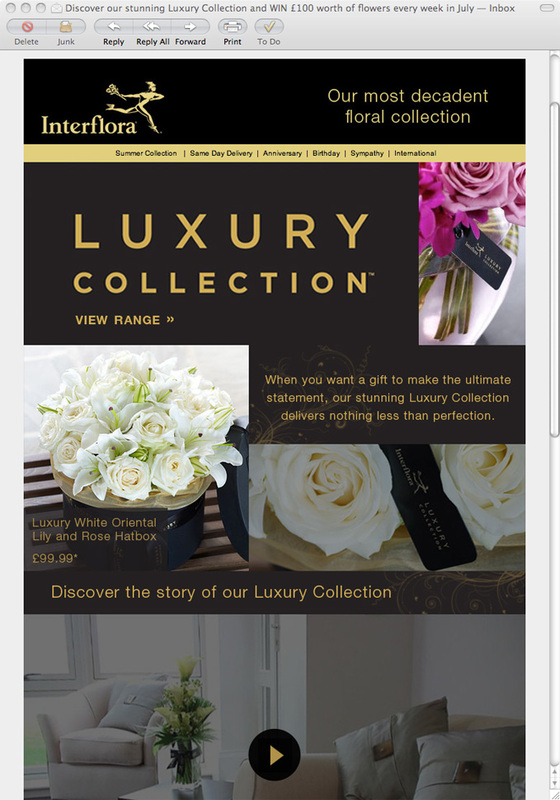 In this email, Interflora chose to focus on a ‘hero’ message: promoting their luxury collection, showing a large image of the product in a room setting that clicks through to a short video outlining the range. The email feels much more targeted than usual and I suspect will get a much higher click-through rate for the target audience. I wonder if they sent it to their full list or a specific segment. Although the email focusses on the luxury collection message, the email also signposts other products / solutions by including a website navigation menu at the top of the email as well as their Facebook & Twitter links. Overall, a good email (providing recipients have images switched on) that combines with the power of video and is likely to have strong impact on the target audience.